Q# How do you implement transaction handling in spring and hibernate? It first discusses hibernate the traditional way, using session etc.then describes hibernate using spring templates. With Spring, you do not need to implement code for obtaining Session objects, starting and committing transactions, and handling Hibernate exceptions. Instead, you use a HibernateTemplate instance to delegate persistence calls to Hibernate, without direct interaction with Hibernate. This page would clear any questions about spring/hibernate including transaction handling, etc. Support a current transaction, throw an exception if none exists. JDBC is a Java standard for database connection. JPA isolates the Java developer from the inner workings of JDBC and database operations. Hibernate, EclipseLink, OpenJPA and Data Nucleus are famous JPA implementations. JTA is a standard for transactions, allowing for management of multiple transactions among multiple databases. JPA utilizes JDBC for database connections and SQL-related operations, and -optionally- utilizes JTA for delegating distributed transaction management details to it. Q# How does hibernate implement caching programatically? There are two types of caching – first-level and second-level. First-level cache is hibernate’s internal cache that it uses for optimizing. Second-level caching, is what we normally refer to as caching generally. Secondary level caching is usually implemented using an algorithm like Least Recently Used algorithm. By storing the data in a cache instead of relying solely on the database, you may be able to significantly reduce the load on the database, and possibly to increase overall performance as well. First-level cache is associated with the Session object, while second-level cache is associated with the Session Factory object. By default, Hibernate uses first-level cache on a per-transaction basis. Hibernate uses this cache mainly to reduce the number of SQL queries it needs to generate within a given transaction. For example, if an object is modified several times within the same transaction, Hibernate will generate only one SQL UPDATE statement at the end of the transaction, containing all the modifications. To reduce database traffic, second-level cache keeps loaded objects at the Session Factory level between transactions. These objects are available to the whole application, not just to the user running the query. This way, each time a query returns an object that is already loaded in the cache, one or more database transactions potentially are avoided. We specify which classes to cache and the caching params but we don’t really write code to invoke the cache. If you feel certain that the problems are due to the amount of traffic between your application and the database. The solution in this case may be a cache. By storing the data in a cache instead of relying solely on the database, you may be able to significantly reduce the load on the database, and possibly to increase overall performance as well. Regardless of which cache you choose, you will need to tell Hibernate what sort of cache rules should be applied to your data. This is defined using the cache tag. You can place the cache tag in your *.hbm.xml files or in the hibernate.cfg.xml file. Alternatively, you can configure cache settings programmatically using the Configuration object. Q# How do you configure hibernate using spring? When the application uses hibernate using hibernate.cfg.xml, the Session Factory configured through it is available to the DAO class. 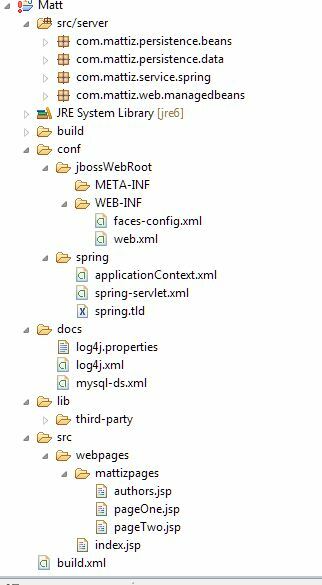 The datasource is configured in Spring’s application context xml. The datasource might be configured using a JNDI context as well. Spring provides support for hibernate through the HibernateDaoSupport class. The HibernateDao support wraps the HibernateTemplate which in turn wraps the Hibernate session object which in turn wraps the Hibernate Session Factory. The session factory is passed a reference to the configured datasource in the spring context. The hibernate template is an abstraction around the usual boilerplate code written when only hibernate is used; and takes care of managing transactions, handling exceptions, managing connections and delegating persistence calls to hibernate. save(), load(), get(), which is invoked on the hibernate session, can be invoked on the hibernate template as well, in addition to find() and findByCriteria() not exposed by the hibernate session. Spring’s IOC layer also allows the DAO class to be loosely coupled from the service layer and be configured through xml files. In a spring application, the dao layer is usually separated from the business layer by a service facade pattern. Transaction management can be done decoratively instead of code. When you use JPA with Spring the underlying Hibernate or EJB3 implementation of the persistence layer is hidden and JPA act as a wrapper over them. The DAO class(Spring) is a wrapper over HibernateTemplate(Spring) which in turn wraps the Hibernate session object which in turn wraps the Hibernate Session Factory. Obtain session from sessionfactory, open transaction from session, commit/ rollback the transaction and close the session. Get hibernateTemplate(Spring) from SessionFactory(Hibernate) to perform the perisistence operations. Don’t work directly with session in Spring. Spring obtains instances of Session objects from the SessionFactory instance. Exceptions emerging from Hibernate are handled by the Spring layer and transactions can be managed if required declaratively by the Spring layer. Q# Explain lazy loading and eager fetch in hibernate. If object A has relation with object B, if you load object A, object B is not loaded from db automatically; it will be loaded only when you do getB(). Eager fetch is the opposite technique. In eager fetch B is loaded when A is loaded if A contains B. The default mechanism is lazy loading. Lazy load will not automatically load child objects. It will load child objects only when getChild() is called. Eager fetch will automatically load child objects when the parent object is loaded. Whether to use lazy load or eager fetch depends on your performance requirements. If you use eager fetch children were already loaded and are already in memory so accessing these objects will be faster. Memory consumption will be more because more objects are in memory even if they are not needed.If you use lazy load, child objects are loaded only when required (when getter method is invoked). Hence accessing child objects will be somewhat slower but will use lesser memory since objects are loaded only if they are required. Q# Give some advantages of JPA over hibernate. When do we use hibernate and when do we use JPA? JPA is a wrapper around ORM technology such as EJB3 and Hibernate among others. Hibernate 3.0 as well as EJB3 implement and support JPA. Code written using JPA uses a standard Java API so that it is generic and implementation agnostic. I could switch hibernate to use something else like iBatis etc. Beneath JPA, the underlying persistence mechanism could be hibernate or toplink or jbatis etc. JPA delegates the database transactions to the underlying persistence layer. The underlying persistence mechanism could be changed anytime and the JPA code wouldn’t change. And hibernate 3.0 implements the JPA specification so TopLink and other O/R mapping framework.So your code depends upon JPA Api and its implementation is supplied by any JPA impl vendor framework. So in effect if you use JPA , you are using a standard Java Api and not some orthogonal Api and hence you have flexibility in your system. Say initially you have used Hibernate but now want to shift to Other framework.That means JPA supports pluggable persistence providers. JPA specification is heavily influenced by current O/R mapping frameworks like Hibernate and Top-Link. Q# What is cascade-all in Hibernate? What are its advantages? In a hibernate mapping file, if you specify cascade=”none” means that saving or deleting first hibernate object has no affect on related object. cascade=”save” means if first object is saved it automatically saves the related object. Similarly cascade delete will delete related object. cascade=”all” is everything save, delete etc even if they are related with foreign keys. The FK constraints etc. everything gets deleted and hibernate takes care of that. You can address the frustrations of the explicit call to save() by using cascades. Q# What is dirty checking in hibernate? What are its advantages? Dirty checking is hibernate is an internal mechanism that ensures that the value of the hibernate POJO object matches what is in the database(synchronizes). If the value does not match it is said to be “dirty” and hence value is refreshed from the database. Hibernate updates only “dirty” objects – only objects that have changed. Hibernate keeps track of which objects are dirty and occasionally “flushes” to ensure the objects are in sync with the db. The advantages of dirty checking is if hibernate doesn’t keep track of which objects are dirty it would have to update all objects that were loaded even if they didn’t change at the final commit of the transaction. What are bean scopes in Spring? Scopes a single bean definition to a single object instance per Spring IoC container. Scopes a single bean definition to any number of object instances. The Java singleton is scoped by the Java class loader, the Spring singleton is scoped by the container context. Which basically means that, in Java, you can be sure a singleton is a truly a singleton only within the context of the class loader which loaded it. Other class loaders should be capable of creating another instance of it (provided the class loaders are not in the same class loader hierarchy), despite of all your efforts in code to try to prevent it. In Spring, if you could load your singleton class in two different contexts and then again we can break the singleton concept. In summary, Java considers something a singleton if it cannot create more than one instance of that class within a given class loader, whereas Spring would consider something a singleton if it cannot create more than one instance of a class within a given container/context. September 27, 2017 Enter your password to view comments. An interesting experiment. I am trying to run a proof-of-concept standalone spring-hibernate application. I modified the jsf-spring-hibernate web application to run as a standalone: http://cuppajavamattiz.com/2007/09/15/a-simple-spring-hibernate-example/ It proved challenging but jsf backing beans not being strongly tied to the request-response mechanism helped and there was minimum possible modification. I have used Eclipse for the following project. An extra download would be for jta.jar. MySql database is the same as used in the previous example. The configuration file for spring-hibernate is mattiz.xml placed in >resources< folder under root. To define hibernate mapping file in a spring web app add the hibernate mapping file entry in mapping resource inside Spring’s applicationContext file in the web/WEB-INF directory or in mattiz.xml as in the standalone example above. 1) a means for resolving text messages, including support for internationalization. 2) a generic way to load file resources. 3) events to beans that are registered as listeners. System.out.println("Inserted/Updated Author, ISBN " + authorName + " "
Run AuthorSearchCreateBean.java as a standalone. I have used a main method in AuthorSearchCreateBean.java to insert/update and retrieve data from the existing database. There is much to be desired. A GUI interface for entering data and displaying data could be developed. You could try a hand at a Swing based data entry/display mechanism to enhance the P-O-C. Good luck! The notes on the simple session bean and entity bean examples on this blog use EJB1.1. Sadly, now it seems that the latest versions of JBoss no longer support this version of EJB. So you would not be able to run the Entity Bean and Session Bean examples posted earlier on this blog with the latest versions of JBoss. Also there seems to be an increasing trend to use ORM (Object Relational Model) persistence frameworks such as Hibernate. I describe below a simple hibernate example. I am using jboss-4.2.1.GA and spring-framework-2.0.6-with-dependencies.zip as the integrated Spring-Hibernate package. The username and password for mySQL is assumed to be “admin” and “admin”. There are two types of dependency injection: setter injection and constructor injection. in spring configuration file as follows. To set properties that reference other beans, the “ref” subelement of “property” is used. identifier, use get() and test the return value to see if it’s null. Spring’s HibernateDaoSupport class is a convenient super class for Hibernate DAOs. It has handy methods you can call to get a Hibernate Session, or a SessionFactory. The most convenient method is getHibernateTemplate(), which returns a HibernateTemplate. This template wraps Hibernate checked exceptions with runtime exceptions, allowing your DAO interfaces to be Hibernate exception-free. Hibernate Session is the main runtime interface between a Java application and Hibernate. SessionFactory allows applications to create hibernate session by reading hibernate configurations file hibernate.cfg.xml. The call to Configuration().configure() loads the hibernate.cfg.xml configuration file and initializes the Hibernate environment. Once the configuration is initialized, you can make any additional modifications you desire programmatically. However, you must make these modifications prior to creating the SessionFactory instance. An instance of SessionFactory is typically created once and used to create all sessions related to a given context. The main function of the Session is to offer create, read and delete operations for instances of mapped entity classes. Spring is a framework for J2EE. It has a number of layers including a MVC web layer, an AOP layer, DAO layer. One can leverage Spring’s DAO Support since Spring has a number of helper classes for JDBC and Hibernate that makes handling connections and Hibernate sessions easy. Spring uses an Inversion Of Control (IoC) design which basically allows one to connect objects through descriptor configuration files instead of instantiating them through code. One creates an interface for both the service layer and the DAO layer. You can then create concrete implementations of these interfaces. In the Spring configuration file one defines what concrete DAO class should be set on the service class. The concrete service object is also retrieved by making a call to the Spring “container”. When the service object is instantiated, the container also instantiates the DAO object and sets it on the service object. What’s nice about this is that should the service class or DAO class ever change we need make changes only in the descriptor configuration files and not in the classes. If the initial implementation of the DAO class was using Hibernate and for some reason we had to later use straight JDBC, then you create a new DAO object and change the Spring configuration without modifying the service layer at all. This is the EJB approach. Here the application objects are not responsible for looking up resources they depend upon. Instead IoC container configures the object externalizing resource lookup from application code. That is dependencies are injected into objects. The lookups are completely removed from application objects. Dependency injection (DI) is a programming design pattern and architectural model, sometimes also referred to as inversion of control or IOC. Dependancy Injection describes the situation where one object uses a second object to provide a particular capacity. For example, being passed a database connection as an argument to the constructor instead of creating one internally. There are three common forms of dependency injection: setter-, constructor- and interface-based injection. Dependency injection is a way to achieve loose coupling. Inversion of control (IOC) relates to the way in which an object obtains references to its dependencies. The advantage of inversion of control is that it decouples objects from specific lookup mechanisms and implementations of the objects it depends on. As a result, more flexibility is obtained for production applications as well as for testing. 1. The core container: The core container provides the essential functionality of the Spring framework. A primary component of the core container is the BeanFactory, an implementation of the Factory pattern. The BeanFactory applies the Inversion of Control (IOC) pattern to separate an application’s configuration and dependency specification from the actual application code. Bean factory is an implementation of the factory design pattern and its function is to create and dispense beans. As the bean factory knows about many objects within an application, it is able to create association between collaborating objects as they are instantiated. This removes the burden of configuration from the bean and the client. There are several implementation of BeanFactory. The most useful one is “org.springframework.beans.factory.xml.XmlBeanFactory” It loads its beans based on the definition contained in an XML file. To create an XmlBeanFactory, pass a InputStream to the constructor. The resource will provide the XML to the factory. This line tells the bean factory to read the bean definition from the XML file. The bean definition includes the description of beans and their properties. But the bean factory doesn’t instantiate the bean yet. To retrieve a bean from a ‘BeanFactory’, the getBean() method is called. When getBean() method is called, factory will instantiate the bean and begin setting the bean’s properties using dependency injection. An example is shown in the standalone class AuthorSearchCreateBean.java http://cuppajavamattiz.com/2008/06/14/migrating-to-a-standalone-spring-hibernate-application/ . iii. XmlWebApplicationContext : It loads context definition from an XML file contained within a web application. 2. Spring context: The Spring context is a configuration file that provides context information to the Spring framework. The Spring context includes enterprise services such as JNDI, EJB, e-mail, internalization, validation, and scheduling functionality. rovides transaction management services for objects in any Spring-based application. With Spring AOP you can incorporate declarative transaction management into your applications without relying on EJB components. Aspect-oriented programming, or AOP is a programming technique that allows programmers to modularize crosscutting concerns, or behavior that cuts across the typical divisions of responsibility, such as logging and transaction management. The core construct of AOP is the aspect, which encapsulates behaviors affecting multiple classes into reusable modules. AOP and IOC are complementary technologies in that both apply a modular approach to complex problems in enterprise application development. In a typical object-oriented development approach you might implement logging functionality by putting logger statements in all your methods and Java classes. In an AOP approach you would instead modularize the logging services and apply them declaratively to the components that required logging. The advantage, of course, is that the Java class doesn’t need to know about the existence of the logging service or concern itself with any related code. As a result, application code written using Spring AOP is loosely coupled. The best tool to utilize AOP to its capability is AspectJ. However AspectJ works at the byte code level and you need to use AspectJ compiler to get the aop features built into your compiled code. Nevertheless AOP functionality is fully integrated into the Spring context for transaction management, logging, and various other features. 4. Spring DAO: The Spring JDBC DAO abstraction layer offers a meaningful exception hierarchy for managing the exception handling and error messages thrown by different database vendors. The exception hierarchy simplifies error handling and greatly reduces the amount of exception code you need to write, such as opening and closing connections. Spring DAO’s JDBC-oriented exceptions comply to its generic DAO exception hierarchy. 5. Spring ORM: The Spring framework plugs into several ORM frameworks to provide its Object Relational tool, including Hibernate SQL Maps. All of these comply to Spring’s generic transaction and DAO exception hierarchies. 6. Spring Web module: The Web context module builds on top of the application context module, providing contexts for Web-based applications. As a result, the Spring framework supports integration with Jakarta Struts and JSF. 7. Spring MVC framework: The Model-View-Controller (MVC) framework is a full-featured MVC implementation for building Web applications. The MVC framework is highly configurable via strategy interfaces and accommodates numerous view technologies including JSP. a. Spring has layed architecture. Use what you need and leave you don’t need now. b. Spring Enables POJO Programming. There is no behind the scene magic here. POJO programming enables continous integration and testability. d. Open source and no vendor lock-in. f. Reduces boiler plate code. g. Allows cross-cutting configurations at a modular level. h. Can run on a web server instead of an application server. e. Uses best practices from the Design patterns – Single responsibility principle, dependency injection, factory pattern, template pattern, singleton pattern and prototype pattern. 1. An interface that defines the functions. 3. A XML file called Spring configuration file. 4. Client program that uses the function.